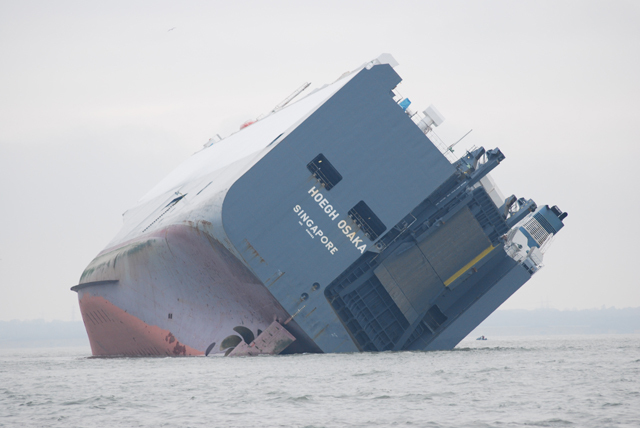 The Höegh Osaka cargo ship, carrying 1,400 cars and 70 to 80 pieces of construction equipment, was deliberately run aground on the Bramble Bank in the entrance to Southampton Water, a press conference was told. Chief executive officer of Höegh Autoliners, Ingar Skiaker, said the pilot and master of the ship made the ‘quick decision’ after the ship began ‘severely listing’ and was believed to be at risk of capsizing. The incident occurred at about 9.30pm on Saturday when Höegh Osaka was en route to Germany. 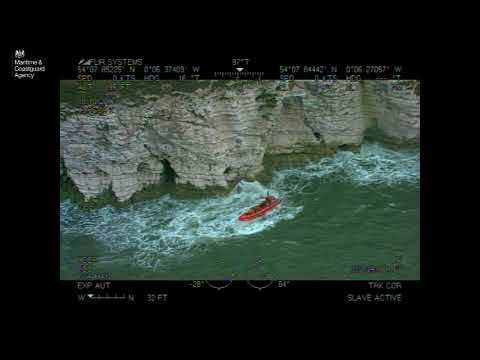 A major rescue operation was launched to save the crew members, two of whom were taken to hospital with minor injuries. Now all 24 crew and pilot have been rescued from the stricken Höegh Osaka in the Solent, protecting the environment is the top priority, the press conference was told. Mr Skiaker said: ‘At this stage it’s too early to speculate on the cause. He added: ‘Now we have all the crew plus the pilot evacuated from the vessel and accounted for. Two crew members were taken to the hospital with minor injuries. To my knowledge one of them had a broken leg. 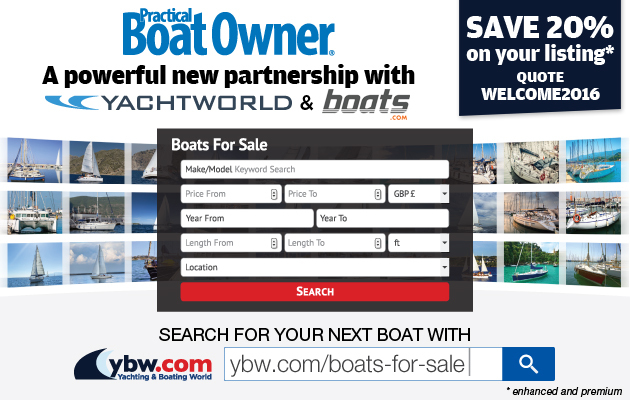 ‘The crew are being offered a lot of support and assistance to help them cope. Mr Skiaker said Höegh Autoliners was supporting the various authorities working on the investigation, led by the Marine Accident Investigation Branch (MAIB). Hugh Shaw, the Secretary Of State’s Representative for Maritime Salvage and Intervention, and ABP Southampton port director Nick Ridehalgh also took part in this evening’s press conference at the Grand Harbour Hotel, Southampton. Mr Shaw : The vessel is listing about 52 degrees, quite substantially. It will be quite difficult for anybody going on board to work on the vessel. ‘We’ve been talking with other key stakeholders and it’s become clear this isn’t going to be a quick incident. Mr Shaw said there had been no loss of the 500 tonnes of fuel on board into the environment. A temporary 200m exclusion zone has been put in place around the cargo ship to ‘keep small craft away from the vessel itself, simply to enable the tugs to work on the vessel’, Mr Shaw said. He added: ‘Over the next few days the weather is looking favourable, certainly up to Wednesday. Mr Ridehalgh also expressed gratitude to all those involved in the rescue operation. He said: ‘ABP as the statutory harbour authority will continue to co-operate fully. ‘An important point is that despite the exclusion zone, the Port of Southampton is open for business, the grounding took place as a result of a quick decision by the ship’s master and pilot. He added: ‘The actions of the pilot and the master of the ship actually grounding the ship meant it is in as safe as possible position. I imagine there was an awful lot of skill and seamanship required to do that. Mr Skiaker added that the Höegh Osaka was only one third full so it had not been overloaded. He said the cars on board were both ‘prestige and standard’, of various models. Mr Shaw said for the time being the safest place for the oil was on the vessel, although this would be assessed as part of the salvage plan and it may have to be removed before the ship is refloated. Refloating the ship would also be subject to weather and tidal conditions.